1. BOARD OF GOVERNORS OF THE FEDERAL RESERVE SYSTEM. 2. BOARD OF GOVERNORS OF THE FEDERAL RESERVE SYSTEM. Our data concerning other major currency pairs has been derived mathematically using the "Currency Pair Equation" table, listed on our site for your convenience. Charts dealing with EURO currency pairs were derived from data gathered on the German Mark (1 EUR = 2 DEM). 1. 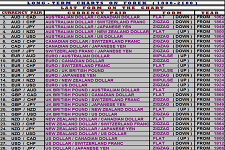 Examine data on any currency pairs for the last 20-30 years. 2. 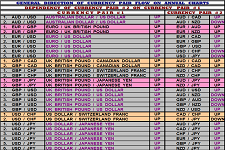 Multiply or divide this data as shown by the "Currency Pair Equation" table. 3. 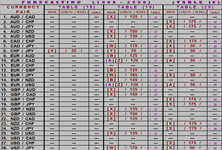 Check the resulting figures online. Using this method, we calculated data for all major currency pairs. 1. 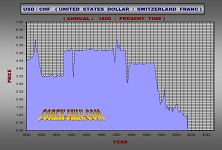 Historical currency exchange rate data table of current end-of-the-year currency closing price dating from the year 1800 to present time. (Examples of USD/CHF, EUR/JPY and AUD/USD are located at our home page for your convenience). 2. 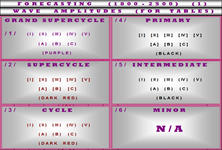 Six additional tables with supplementary information related to currency exchange trading. Price of subscription for personal use: $ 100. Price of subscription for business use:$ 200. 3. 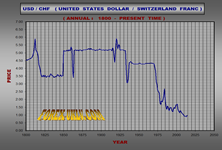 Annual currency exchange chart dating from the year 1800 to present time (Types “A”, “B”, “C”). 4. 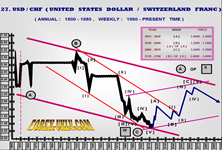 Monthly currency exchange chart dating from the year 1980 to present time (Types “A”, “B”). Price of subscription for personal use: $ 200. Price of subscription for business use:$ 400. (to 2100). 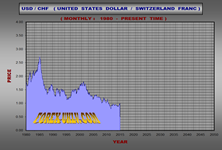 (Examples of USD/CHF, EUR/JPY and AUD/USD are located at our home page for your convenience). 5. 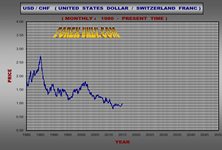 Monthly currency exchange chart dating from the year 1980 to present time (Types “A”, “B”). next 50 years (to 2050). (Examples of USD/CHF, EUR/JPY and AUD/USD are located at our home page for your convenience). Price of subscription for personal use: $ 300. Price of subscription for business use:$ 600.
to present time. 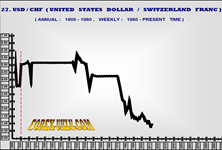 (Examples of USD/CHF, EUR/JPY and AUD/USD are located at our home page for your convenience). Price of subscription for personal use: $ 1,000. Price of subscription for business use:$ 2,000. 3. 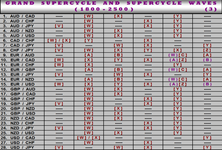 Annual currency exchange charts for 28 currency pairs dating from the year 1800 to present time (Types “A”, “B”, “C”). 4. 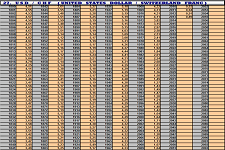 Monthly currency exchange charts for 28 currency pairs dating from the year 1980 to present time (Types “A”, “B”). Price of subscription for personal use: $ 2,500. Price of subscription for business use:$ 5,000. 5. 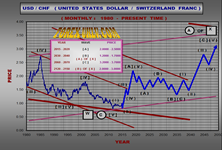 Monthly currency exchange charts for 28 currency pairs dating from the year 1980 to present time (Types “A”, “B”). 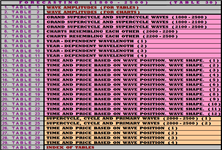 names of “Charts Resembling Each Other (2200–2500)”, “Year-Dependent Wavelength”, and “Index of Tables”. Price of subscription for personal use: $ 5,000. Price of subscription for business use:$ 10,000. 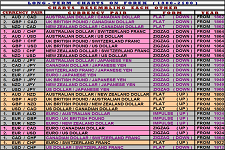 The complete list of 28 major currency pairs can be found at our Home page and our Pricing page. You can adjust the values along the “X” and “Y” axis at our charts. Please see instructions on how to adjust the axis at our page Contact Us. If you are interested in our products covering single currency pairs (more than one possible), we will send you your order within two business days. 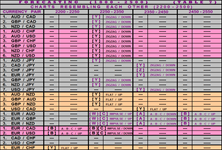 If you are interested in our products covering the 28 currency pairs, we will send you your order within one week.